The gut is arguably the most influential body part in a mammal, for a variety of reasons. A lesser known fact about a dog’s gut is that it is home to a unique colony of bacteria, called the gut microbiome. This microbiome has many roles from digestion to immune system support. Here, the gut microbiome will be discussed, as well as how pet owners can better support their dog’s health. What is in the Gut Microbiome? The gut microbiome is the colony of bacteria that live inside your dog’s digestive system. 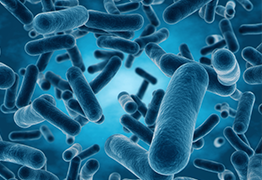 There are many types of bacteria that might be present, including bacteria from the Bacteroidetes, Actinobacteria, Proteobacteria, and Firmicutes phyla. A healthy gut microbiome is one in which various healthy bacteria strains coexist in good balance with one another. If there is an overabundance of one good bacterial strain and an underabundance of another, the animal simply may not thrive. However, if the colonies of good bacteria are destroyed and replaced with harmful bacteria, the dog may not survive. The healthy bacteria in a dog’s gut is the first line of defense against dangerous bacteria that enter through the food supply. 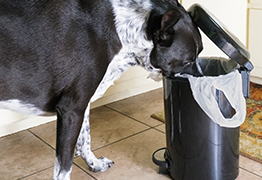 For instance, a dog that consumes rotten meat from the garbage will likely ingest e. coli. A healthy gut will kill anything harmful that enters the digestive tract. A healthy microbiome attaches to the lining of the intestines and prevents harmful substances from entering the bloodstream. These substances include environmental toxins and carcinogens. When the gut microbiome is intact, the harmful substances will pass straight through the intestines as waste. Healthy bacteria in the gut help with digestion by producing enzymes that aid in nutrient uptake. Without a working gut microbiome, dogs may have a more difficult time with thiamin, cobalamin, and vitamin B12 uptake. A growing body of research has shown that bacteria communicate with the brain. An unhealthy microbiome has been linked with depression, anxiety, and poor coping skills. The gut microbiome doesn’t just support the immune system; it IS the immune system. Bacteria work in conjunction with gut-associated lymphoid tissue, which comprises 90% of the dog’s immune system. Without a healthy microbiome, a dog’s ability to fight infection and disease is severely hindered. Dog foods that have been overly processed contain no healthy bacteria, which is essential for supporting useful bacterial colonies. Additionally, low-quality foods have high percentages of simple carbohydrates and starches, both of which serve as a food source for bad bacteria. 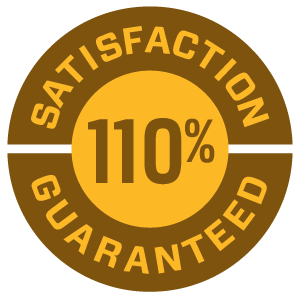 Feed your dog a high-quality blend that is low in fillers, preservatives, and artificial ingredients. 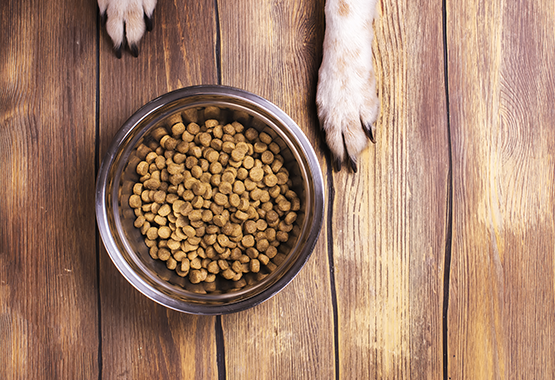 Blends that focus on gut health are great choices for your pet. Antibiotics work by killing bad bacteria that cause disease and infection. However, they also kill GOOD bacteria. Always give your dog the entire dosage of medications that are prescribed. However, talk to your veterinarian about supportive measures that can be taken during antibiotic treatment, such as a probiotic, prebiotic, or yogurt supplement. Much to the dismay of most dog owners, it is fairly common for a dog to consume feces of other animals. While this practice is mostly safe, it does present the risk of introducing bad bacteria into your dog’s gut. If too much bad or competing bacteria are introduced, your dog’s microbiome may suffer. Teach your dog the “leave it” and “drop it” commands and keep your yard neat in order to prevent unwanted coprophagic tendencies. The good bacteria that live in the intestines serve as a barrier which prevents toxins from entering the bloodstream. However, when the bacteria populations are not sufficient, gaps in the intestinal lining can form and allow food proteins to enter the bloodstream. Once these proteins have breached the intestinal wall they are attacked by the immune system. Chronic inflammation ensues, which further disrupts the gut microbiome. WINPRO® Immunity is specifically formulated for gut health and the inflammation that is consistent with leaky gut syndrome. 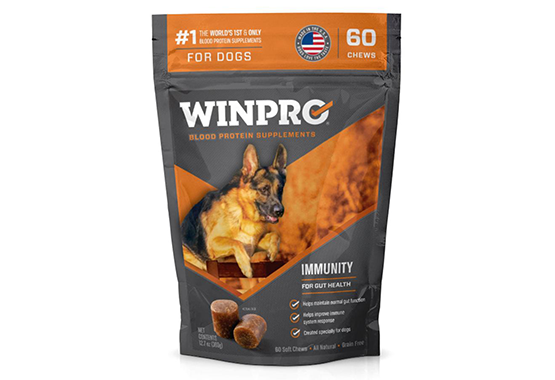 WINPRO Immunity, like all WINPRO products, contains scientifically proven animal blood proteins that go immediately to work in the gut to eliminate inflammation. Deglycyrrhized licorice root and marshmallow root powder soothe any gastrointestinal problems that may be caused by leaky gut syndrome, such as vomiting or diarrhea.